As with any profession, we understand that our reputation is built over years and years of doing the right thing. In dentistry, excellence requires a blend of clinical skills, communication, and compassion for each patient. While the respect of our patients is most important, it is also an honor to be recognized by others. 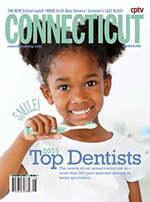 Please take a minute to read the article below and help us congratulate Dr. Venu Chimmiri for being selected as one of the Top Dentists in Connecticut for 2014.